The roadshow is coming to town… and bringing good news for a sustainable future. What will life be like in your city the coming decades? After Amsterdam, Belfast, Izmir, Dubrovnik, Menorca and Roeselare, … UK Preston citizens were invited in the week of November 12 in the frame of the EU funded City-zen project to co-create on the future of their City. Together with city inhabitants, local businesses and council members, the roadshow expert team envisions a sustainable future for the city, brilliantly combining technical decarbonization solutions with stunning architectural and urban design proposals to offer augmented quality of life. This overclouded current reality sets the tone and urges for sustainability action. The local citizens have huge impact from the very beginning onwards in the co-creating process. Unlike Google, the roadshow team tries to find out what the questions are before giving answers. Will it be a healthy and pleasant environment to live and work, presenting itself as an attractive centre for the wider area? What should for sure be altered in the next scheme of city improvements? To get some tangible answers to these questions and many more, citizens bring in indispensable ideas and information about local context into the design process to create a sustainable city. To crystalize their ideas, dreams and realism, the expert guidance of the roadshow team was there to guide them for an entire week. Indeed, city transition to a sustainable future works when people living in it carry the vision for it. 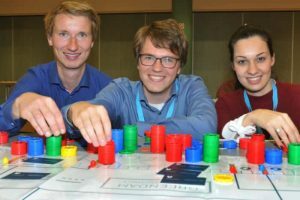 To get a grasp of the process and the different actors involved in the energy transition of a city, the roadies even brought in a game, be it a serious one. In the game GO2ZERO participants take up the role of local government, network planner or any of the other acting parties involved in city energy planning. By doing so they get to experience the consequences of decisions in the transition towards a zero-energy city. This role-playing game clearly showed the complexity of the transition and the different incentives of the various stakeholders in the energy planning of a city. Looking for an overall sustainability goal, one could easily end up getting disappointed by the hidden agendas of several stakeholders around the table. One can imagine the huge sustainability challenges we face on a global scale. In the Broadgate district of Preston, the carbon footprint of an average household is 7 tons of CO2 equivalents, corresponding with 1,3 football fields of forestland. Pac-Man (of who we now know dr. Riccardo Pulselli is the true identity) dropped by to chase carbon footprint to an amount that can be nicely offset by a forest area the size of a small city park rather than taking respectable share of the county. How does Pac-Man work? The true name of the Pac-Man game is carbon accounting; he first translates energy use, mobility, waste, water and food consumption of the citizens into an environmental footprint expressed as tons of CO2 equivalents. This is then translated to the forest size needed to offset these CO2 emissions. Consequently, he repeats this after implementation of the roadshow solutions to decarbonize the city. Then Pac-Man is released to indulge in eating all the forest area that represents the gains in carbon footprint. Njamnjam for a better future! For the Broadgate district Pac-Man had to face about 800ha of forestland corresponding with a carbon footprint offset of 10.500 tons of CO2 equivalents per year. That’s right, Broadgate currently needs forestland 20 times (about 800ha) the size of the district (about 40ha) to offset its current consumption levels and even 30 times when additionally accounting for food of a meaty diet. Pac-Man did not have to leave hungry. He only needed to leave 23ha of urban city forestry for carbon footprint offset leaving the city fully decarbonized after roadshow measures are implemented. Two weeks before the roadshow expert team shows up, the SWAT studio student team of TU Delft start preparing a diversity of sustainable solutions by low energy architectural and urban designs. From professors a strong motivation and professional attitude is business as usual, but these students were hard to compete with. 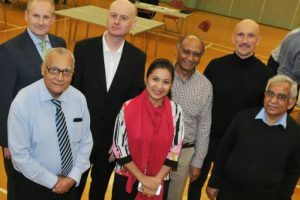 The drive and enthusiasm they displayed during the roadshow was clearly translated into their contributions for the designs of Preston districts Broadgate, UCLan university campus, the waterways, Fishergate and the station area. The City-zen roadshow team of experts joined them in the middle of community centers to work intensively on solutions for the city transformation towards a zero-carbon future. City urban design, buildings, mobility, waste management, water and even food consumption levels were put to the test and mitigated to a skinny environmental footprint. The Gujarat/St. Stephen’s community center was given an extended role as a neighborhood energy facility with waste water treatment and urban farming. Some ingenious solutions with greenhouse constructions nicely integrating energy efficiency, passive heating and natural ventilation options combined with food production possibilities were included in a broad set of low-carbon energy options for the district. The role the Ribble river will play for Preston was completely reinvented. Flood risk problems of the Ribble river, threatening the Broadgate district and lower Penwortham for several years now, were tackled along with the harvesting of river tidal energy to feed the city and more with renewable electrical energy. Neglected areas were given green and new functions to integrate them in the Preston daily life and improving the disclosure of the neighborhood. Accessibility and connections to outer regions of Preston and mobility in the city was transformed to stimulate the modal shift away from car abundance allowing for more space for quality of life. All of the technical solutions to minimize the carbon footprint of Preston were integrated in an innovative urban design proposal. In this plan the hotel with its beautiful park hill is restored to the landmark status for Preston that it deserves. An open square is added on the city side to open it up to those entering Preston by train and to the rest of the city like if it were presented on a plate. Extension with other functions, such as conference center, wellness activities etc… can bring new attention to the city as well. These are just some of the solutions proposed by the Roadshow team. Do you want to know more about the Roadshow’s vision for Preston?